WWE 2K16 Special Edition - Only at GAME! WWE 2K16 features the biggest roster in WWE video games history, featuring WWE and NXT Superstars, Divas, and Legends! 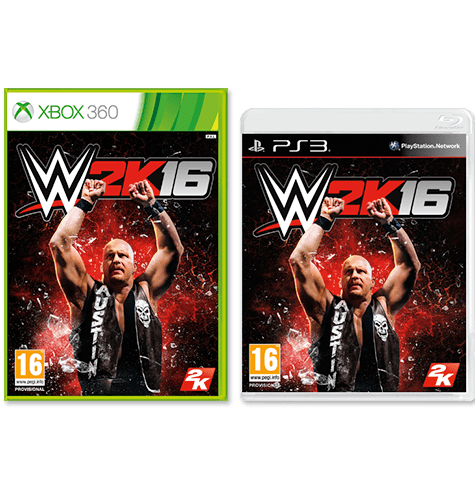 Play through the WWE 2K16 Showcase and relive the legendary career of Stone Cold Steve Austin, or build your own Hall of Fame legacy in MyCareer, in the most authentic, comprehensive, in-your-face WWE video game of all-time! Get in the ring and Raise Some Hell with WWE 2K16! 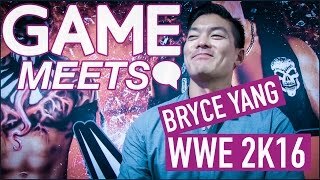 The undisputed champion of wrestling games returns with the biggest roster in WWE games history, featuring WWE and NXT Superstars, Divas, and Legends! Play through the WWE 2K3:16 Showcase and relive the legendary career of Stone Cold Steve Austin, in the most authentic, comprehensive, in-your-face WWE video game of all-time! 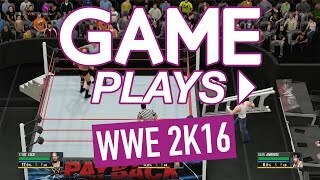 2K16s core wrestling gameplay is smoother and more responsive than ever! With lots of new moves, you can Raise Some Hell on your opponents. 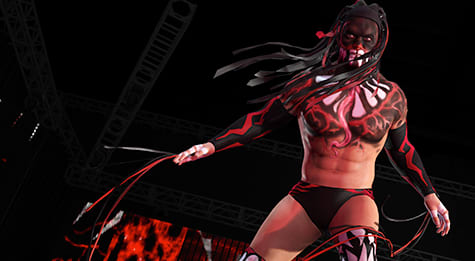 Get in the ring with WWE 2K16! The undisputed champion of wrestling games returns with the biggest roster in WWE games history and the Texas Rattlesnake Stone Cold Steve Austin as its Cover Superstar! Extend your WWE 2K16 experience with the WWE 2K16 Season Pass! Includes over 30 new characters from WWE Legends to NXT Superstars, over 30 new moves, 7 classic matchups in a the WWE Hall of Fame Showcase, and the WWE 2K16 Accelerator! 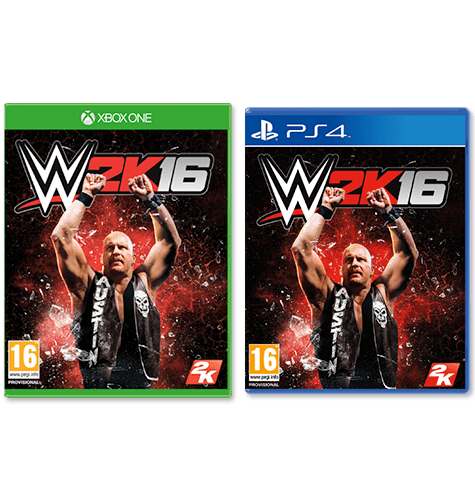 8/10 - WWE 2K16 rights the wrongs of previous games by including not only a number of awesome creation modes, but also improving most of the mechanics we've come to expect from the series. It proudly carries the championship, thanks to a number of key inclusions to keep fans enticed, as well as a presentation that represents WWE and NXT programming. Should you buy it? YES! YES! YES! Screenshots are not representative of gameplay on Xbox 360 or PlayStation 3. ©2005-2015 Take-Two Interactive Software and its subsidiaries. 2K, the 2K logo, and Take-Two Interactive Software are all trademarks and/or registered trademarks of Take-Two Interactive Software, Inc. All WWE programming, talent names, images, likenesses, slogans, wrestling moves, trademarks, logos and copyrights are the exclusive property of WWE and its subsidiaries. © 2015 WWE. All Rights Reserved. *Terms and Conditions: UK ONLY. Limited Offer while stocks last. 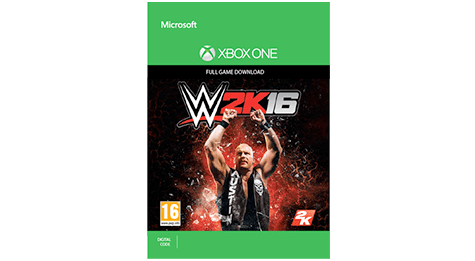 Customers who have already pre-ordered WWE 2K16 for Xbox One, PlayStation 4, Xbox 360 or PlayStation 3 will also receive the bonus item. Your item will be delivered with your pre-order of WWE 2K16. This offer is only valid against mint boxed copy of the game and not the download or preowned. Bulk or Business preorders (orders in excess of 10 copies of the same game) will only receive 1x bonus item per order not per copy of the game. This offer is exclusive to Game Retail Ltd.